Exeter-based Lightfoot, the award-winning, government-supported in-vehicle driver improvement technology, is celebrating having been shortlisted for the prestigious 2017 Design in Innovation Awards, held at Innovate 2017, the UK’s leading innovation show. Based on Lightfoot’s Exeter trial, where 100 private motorists had the device installed in their vehicles, the submission focused on the dramatic impact that its technology is having on drivers across the city. Judged by an expert panel, which included Innovate UK Chief Executive Dr. Ruth McKernan, Lightfoot was selected as one of just eight businesses to make it through to the finals from a field of over 70 contenders, each of which had been hand selected by Innovate UK to showcase the brightest and boldest UK innovations to over 2,500 businesses from around the globe. Lightfoot’s entry was of particular interest to the judges as its in-vehicle device, described as the “Fitbit for cars and vans”, has been used to transform the way individuals drive in the city of Exeter. By encouraging smoother, more efficient driving, Lightfoot is slashing pollution and fuel bills, while helping to reduce accidents on the road. Installed in over 100 vehicles across the city, Lightfoot has helped cut CO2 by a tonne a week, lowering nitrous oxide emissions by 20% and reducing particulates by 15%. Of those participating in the trial, 99% of users experienced improved fuel economy, with average mpg gains in excess of 15%. However, what really impressed the judges was Lightfoot’s approach to competitive efficiency, which incentivizes Lightfoot users to drive more smoothly and considerately through the prospect of winning prizes. These prizes range from a year’s supply of pies to a track day with Nigel Mansell. Combined with the real-time feedback that Lightfoot provides to the driver, Lightfoot instantly and consistently cuts pollution on the roads by linking rewards for better driving with connected car technology. 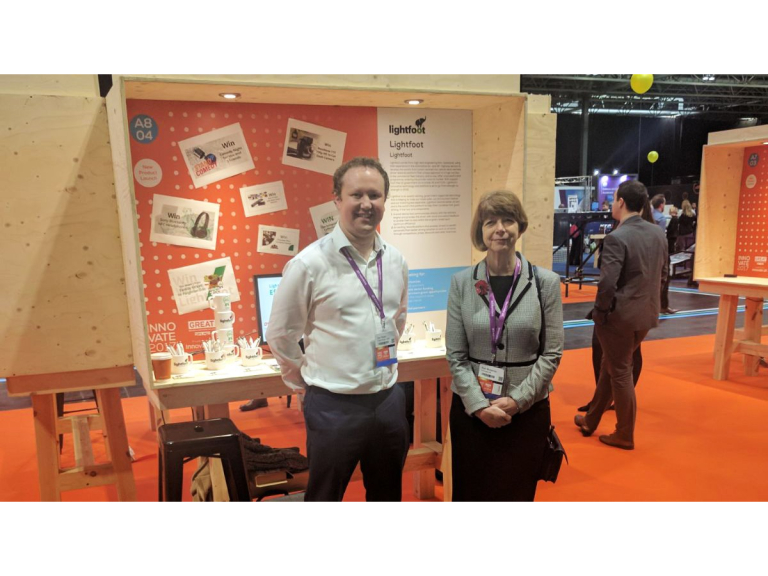 Dan Regan, Head of Engagement at Exeter-based Lightfoot commented: “Making it to the finals of the 2017 Design in Innovation Awards is a huge honour. It further endorses our work to help businesses, individuals and local authorities tackle pollution on the roads, providing a practical and deliverable solution here and now. Earlier this year Lightfoot received almost £1million in Government funding from Innovate UK and The Centre for Connected and Autonomous Vehicles (CCAV) to further develop its technology. Combined with growing demand for its product from fleets, Lightfoot has expanded its team by 60% and is rapidly advancing a range of projects that will bring cleaner, greener and cheaper motoring to drivers across the world, making smoother driving simple, fun, social and addictive. Within the next six months, Lightfoot plans to move into new, larger premises at Harcombe Cross on the outskirts of Exeter, which is currently being fitted out for both the Lightfoot team and its sister company, Ashwoods Electric Motors. Lightfoot’s next step is to take its technology, which is being used by hundreds of fleets across the UK to cut fuel bills, emissions and accidents, to the consumer audience.